EpfIndia website passbook.epfindia.gov.in – UAN Login Employee Activation, PF Balance Check without UAN number, Link your UAN with Aadhaar, Epf Withdrawal, Epf Interest Rate (8.55%), PF Claim Status, Pension Status, Print Updated Passbook, Print your UAN Card, EPS Withdrawal in …. EPF (Employee Provident Fund) is a social security scheme that is created through the contribution made by an Employee during his active service period and a matching contribution made by his employer. The contributions are paid regularly every month during the period of employment of the employee till he retires. Epfindia.gov.in is the official web portal for EPFO India. The aim is to build a corpus of funds available to the employer upon his retirement. Thus it amounts to creating a retirement fund or savings. The EPF scheme is applicable across India and across industries and organizations. The EPF is managed by the Employees’ Provident Fund Organization (EPFO), which is a government body created through the Employees’ Provident Funds & Miscellaneous Provisions Act, 1952 which extends to the whole of Indian except Jammu and Kashmir. There are more than 5 crores subscribers to the scheme and it ranks among the largest social security schemes in the world. The Employees’ Provident Fund is created to provide financial security and stability to employees. An employee begins contribution once he joins a company. These contributions are made monthly on a regular basis. By saving a fraction of his salary every month, an employee can use it when he is not in employment or has retired. The rate of contribution for both the employee and employer is at the rate of 12% of wages. In addition the Employer also contributes Administrative Fees and EDLI. How to Get PF (Provident Fund) ? PF can be withdrawn only under certain situations. In case of partial temporary withdrawals there are certain provisions that need to be complied with. In this case the employee can get the PF as a temporary loan which must be deposited back to the Fund. Earlier, beneficiaries under the scheme, after separation or resigning from a job do not get their PF transferred from the previous employer to the new employer. One reason for this was that earlier the PF transfers often took time and were very complicated. Moreover, the funds were safe in the hands of EPFO and kept earning interests. If anybody want Transfer the Provident Fund Amount it is possible to transfer PF amount from one pf account to another new pf account. The EpfIndia website https://epfindia.gov.in gives you all the information about EPF that you will ever need. This includes your PF Balance Check with or without UAN Number. You will need to have UAN for accessing most of the features. Here is how you can use the EPF portal for checking your EPF Balance using your UAN or PF number. For checking the PF Balance, the employee needs to have his PF account linked with the UAN number. The user needs to click on the tab “Our services” You will see a drop down showing various services. User needs to click on “For employees”. When the person clicks on “For Employees”, he will be directed to another page with the services. Click on Member passbook under services. Once you click on login button, you will be able to see the member IDs under your account. You can click on the specific member ID to see your details. Once you click on the specific member ID, you will be able to see the detail pass book of that account. The pass book will show the contribution of the Employee and the Employer separately. This is a very limited or restricted method of EPF Balance Check, as compared to the one that you can do with an UAN. To get your EPF Balance using the PF Number, follow the following steps. At the bottom of the page, you will find; Click here to Know Your PF Balance. Enter your PF account number, name, and mobile number. Select the I Agree, checkbox. That is all required to be done, to know your EPF Balance using you PF Number. Nowadays it is not possible to EPF balance check without UAN number. After UAN and Aadhar seeding has become a mandate for PF account, it is compulsory to have a UAN number. You can do that by checking the status of the UAN number and it is showing not available, you can contact your employer to get the UAN number or can contact the local PF office for assistance. The facility can be used to view the UAN passbook of the members who are registered on the unified member portal. For a person who has newly registered to the account will be able to access the account after 6 hrs of successful registration. Similarly any changes in the account will be made effective on the account in 6 hrs from the changes. Passbook will have the entries which have been reconciled at the EPFO field offices. EPFOHO UAN ENG. ENG is the first three characters of the language you prefer. The facility is available in many national and regional languages like Hindi, English, Marathi, Punjabi, Gujarati, Marathi, Kannada, Telugu, Tamil, Malayalam and Bengali. The details will only be available for the registered members. So it is important that the UAN is linked with account numbers. PAN number and Aadhar number. By giving a missed call: Registered members can also check the details by giving a missed call to the following number 011-22901406. The missed call should be given from the registered mobile number only. By using EPFO app: One can also check the balance using EPFO app. The app can be downloaded from the google play store. Once the app is downloaded, one needs to click on the Member and then on the Balance/Passbook. After that one needs to enter UAN and the registered mobile number to get the details. If you have your UAN which is activated, then checking your EPF Claim status or PF Claim Status becomes very easy, simple and straight forward. This is the new facility offered by EpfoIndia. Just follow these steps. The screen will display two boxes or fields where you have to input the information. That is all you need to do. Your EPF Claim status will be displayed on the screen. There is also an old way of checking Claim status by EPF number. 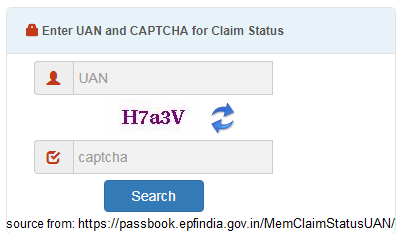 If you want to check your EPF claim status online at https://epfindia.gov.in then you need to follow these steps. Select your State and then the EPFO region, office from the drop-down list. On the screen displayed, Fill up the blank boxes with your EPF account number. The first two boxes containing State and EPFO office will be filled up automatically. Fill the extension code, if it is there in your EPF account number else leave the 3 digit extension code blank. Your EPFO claim status message will be displayed on the screen. It will also give you an idea of the time it will take to get your EPF balance deposited in your bank. 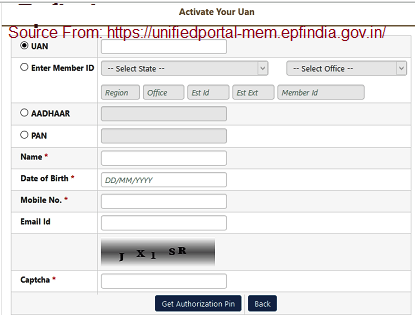 How to Activate Universal Account Number (UAN Activation Procedure) at unifiedportal-mem.epfindia.gov.in? What is UAN? It is a simple way of identification available for all employees. There are very rules and regulations that govern the process or procedures followed in getting a Universal Account Number. At the same time, it is important to understand that this is not just meant for governing the employees only but the employers as well. This is because, any organization, company or establishment that has more than 20 employees is expected to own a Universal Activation Number. Although this has not well into people, but with time is getting implemented better than before. There are several benefits of registering or activating Universal Account Number and below are the main benefits. You can be able to download or print your updated passbook anytime. (This is easily available in the website). At the same time, it becomes easy for you to download your Universal Account Number Card from the comfort of your house. The last major benefit is the fact that, you are able to update your KYC information with just a few clicks. Once you have registered for your Universal Account Number, it is important for you to activate it so that you can be able to easily access it. The procedure followed in activating your UAN is also a very simple procedure and takes just a few minutes especially for people who are computer literate. After find the option “Activate UAN”. Click on the link. Then Entering your Universal Account Number: This simply means typing in the UAN you want to activate and it is as simple as it is. Select State: There is a drop down for this with all the states to be covered in the region and all you are expected to do is select your state from thdrop-downwn. Filling in your Region: For the region, you need to key in your region as it is officially known. Fill in the office details: This one needs you to key in the necessary details as there is ndrop-downwn provided to make your work easier. Est Id: The next step is keying in your estate identity which has to be done manually as there is no dropdown provided for the same. Est Ext: This is the same as the above four. You key in the necessary details of your Est Extension. Fill in your Member Id: This is the last step in this second procedure of activating your UAN. If all the procedures are well followed, you can then proceed to the next step. Key-in your Aadhaar details: Just as we had mentioned before, it is now mandatory to seed your Aadhaar with your UAN before activating it. You are provided with a space for doing that. PAN: After keying-in your Aadhaar details, what follows is the PAN details in the space provided. Once you have filled your Aadhaar Number and PAN Numberdetails, you will be expected to fill in your personal details are as follows. Name: Make sure that you enter the name as per certificates. Use of pet-names or any other names not in the government’s database might give very different results and it is not allowed. Date of Birth (DOB): In this part, you also have to be sure of the details you fill (no guesswork). Ensure you enter the details as they are in your SSC certificate. Mobile Number: It is very important to understand that you can only use one phone number when registering your Universal Account Number. Therefore, make sure you enter the valid mobile number you use regularly. Email Id: Give there official details that you use regularly to ensure you’ll easily be reachable in case of anything. Once you have filled in all the necessary details, you will receive a Captcha to confirm that you are not a robot.If you fillthe letters given in the right way you will receive an authorization Pin and your account will be ready for use. In case you have any questions, you can call their office number and you will receive the necessary support. Once you know your UAN, then the next step is to Activate UAN. Without activation of your UAN, you cannot take advantage of the several features that EPFO website provides. Also you will not be able to get your EPF Balance by sending a missed call or messages to EPFO numbers. You will also not be able to use the EPF app on your mobile. Therefore, it is imperative that once you get your UAN, you must activate it. You can now view your contributions and EPF balance in the Member PassBook page and also download and save it. You can take a print out of your UAN Card for your reference. You can claim for Transfer and even withdrawal of funds. You will also be able to modify or edit your profile data such as mobile number, email id, KYC, password etc. Now, when you have generated the UAN for yourself and have activated the same, it is time for you to login to the UAN website it avails all the related services provided by the EPFO portal. The process of Login is quite simple and do not require any specific or detailed instruction to do so. The home page of the website clearly gives an idea about where you can enter your username and password to login to the portal. But, if somehow, you find it difficult to log in to the portal, let me help you with that. Follow these simple steps to log in to the unified portal of the EPFO. Open the official web page of the unified portal. In the upper right-hand corner of the screen, you will be able to see a box, asking for the UAN and password. You need to enter your UAN and the password you have selected while registering the UAN and then click on the ‘Sign In’ tab. You are now all done. In case, you have forgotten the password, but know the UAN, you can retrieve/reset the password by clicking on the ‘Forgot Password’ button. This will help you to reset the password easily. But it is necessary for you to have access to the registered mobile number associated with the UAN. Once in a while people Forget UAN Password and want to recover or Reset Uan Password it. The procedure for doing it is actually very simple. Here you will learn to do it yourself. Just follow these steps. This will work if your particulars that you enter, like Name, Date of Birth, Gender and Aadhaar / PAN etc. matches with what is available with EPFO. Often it happens that some data may have been entered wrongly by the company staff while feeding the information in the EpfoIndia website. In such cases when you enter the correct data it will not match with that in the EPFO database. You will receive an error message. In such cases you should immediately contact your employer to get the details. Enter your UAN number and the Captcha. Your mobile number in your UAN database will be shown. If you want to change the mobile Number, click No. You will be asked your Name, Date of Birth, Gender, KYC Type, and Document Number. Enter these details. Click on Verify. If OTP is successfully sent, you will see the message OTP is successfully sent. Sometimes you may get the message – Failed to send OTP. Please try again later. In such case you can re-try after some time. If OTP is sent successfully, then you will get the OTP on your registered mobile number. Enter the OTP at Enter Authorization Pin. Enter the New Password. The Password must have minimum 7 characters and minimum 4 alphabets, minimum 2 digits, 1 special character. Out of the minimum 4 alphabets there should be at least one capital and one small letter. Next, Confirm the New Password. You will receive a pop-up message – password successfully changed. Congratulations! You have successful Recovered you lost UAN password and hot new password. Now you can Login to the EPFO website with your new Password. The KYC details are always needed by the new employer. The best feature of this portal is that the KYC details can be updated any time, if your mobile number is changed or if you need to change any other detail. Do you know the employer IDS can also be listed on the unified portal? The listing of the employer IDS on the unified portal helps in the consolidation of the accounts. The updated KYC helps in the quick KYC transfer of the money or in the withdrawal. In case the bank account details are not updated on the KYC, the claim of the PF can be rejected. So the KYC details must always be updated. If the KYC documents are not updated, the person will not get all the account related information on the registered mobile number. Employee’s Provident Fund Organisation (EPFO) has provided eKYC portal for Linking Aadhaar number to UAN account. You can check your account PF Balance using UAN / PF number whenever possible by using UAN portal. We have provided the procedure for how to link Aadhaar number to UAN. Here are the steps to you to get information. Search Aadhaar Link/ eKYC on that home page, then click on it. It will open a new webpage: https://iwu.epfindia.gov.in/eKYC/. You can also see the image of eKYC Portal as below. 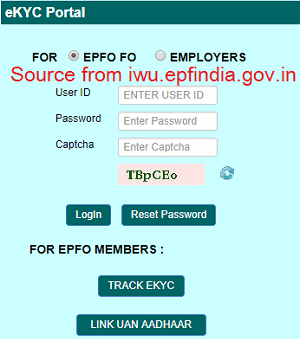 EPFO FO/ Employers should enter your User ID, Password and Captcha codes and click on Login Button. Enter your UAN, Mobile Number ( Registered/ Already Liked with UAN), then click on ‘Generate OTP’. Then you will get an OTP number to your registered mobile. Enter the “OTP” for confirmation and Gender, Aadhaar Number and Capta Code. Note: For Aadhaar Number verification You can select ‘Using Mobile/ Email based OTP’/ Using Biometric. After enter the details completely in all respects, you can click on ‘Submit’ button. Finally you can get an email of successfully linked to your registered email address and also the sms to your registered mobile. Some people say that it is mandatory to link UAN to Aadhaar. To clear the misconception, it is just highly advisable to link UAN to Aadhaar for various reasons, but it is not mandatory. Actually, all the services provided by the EPFO unified services portal can only be availed if one has linked the UAN to Aadhaar, so people think that it is mandatory to link Aadhaar and UAN. The linking of the UAN and the Aadhaar makes the process of claim settlement very smooth. UAN Member Passbook in passbook.epfindia.gov.in? For a EPF member who has an UAN and password; accessing the Passbook is very easy, convenient and readily accessible. The process is given in these steps. On the Member Passbook page, Login with your UAN details. Enter the 12 digit UAN number and Password of UAN website. You can now view the Passbook. You can save the Passbook by selecting Print, and then Changing Destination to Save as PDF. Go to the EPFO official website – https://passbook.epfindia.gov.in/ and start by creating your UAN based login ID. Once this is done, you will be redirected to another page where you will be prompted to enter your UAN, details of your current employer including: establishment number, state and account number. You will also be required to enter your mobile number. The third step involves checking whether the account qualifies to make direct transfer on the EPFO site. To check this, fill in the state where your employer was situated and search by either the establishment number or name from the dropdown menu. Click on ‘Check Eligibility’ icon. You will then receive a notification indicating whether your account was eligible or not. If it is eligible, then you are ready to continue with the online registration of the transfer. You will be prompted to submit a legal photo ID like an Aadhaar, PAN card, or a driving license. A One Time Pin (OTP) will be sent to your registered mobile number. Ensure you correctly key in the Pin provided in order to receive a confirmation message. This now leads you to the Employees Provident Funds Member Claims Portal. Note: When logging in, you can use your phone number or document ID. Once you sign in, you will be able to access all the options available. On the top tab, click on the ‘Request for transfer of account’ icon. This will not prompt you to fill the Provident Funds transfer form. The first part is where you fill in your personal information. In this part, you will be expected to enter your official names, your bank’s IFSC code, email address and finally your salary account number. The second part is where you fill in the details of your old Provident Funds account. The last part is where you are required to enter the details of your current PF account. This is followed by the attesting of the claim which can be done by either your previous or current employer. Once all this is done, it is very important to counter check all the information you’ve filled in to ensure they are correct and if do the right corrections if need be before submitting. If you’ve confirmed that all is as it should, enter the captcha to get your PIN. Then click ‘I Agree’. The last step is entering the PIN for the claim transfer to be initiated. Caution: It is possible to check the status of your transfer once it is initiated. You can do this by either following the procedure provided on the portal or if not possible, you can enquire from either your current or previous employer. If these two options becomes a challenge to you, you can opt to write to Employees Provident Fund Organization (EPFO) directly and you will be assisted. How to Check UAN Status at unifiedportal-mem.epfindia.gov.in? Universal Account Number (UAN) is a 12 digit number that is allotted by the EPFO to give a unique identity to an EPF subscriber. UAN also makes it easy for online accessing your EPF account. It also helps in transferring EPF easily when one changes job. The UAN remains the same from a lifetime of the employee and can be used anywhere in India. The EPFO allot the UAN to the employer on behalf of the employee. This is done after the KYC details are filled-in by the employer and it is verified on the EPFO portal. Once EPFO allots the UAN, the employer will provide it to the employee. You can also check the status of your Universal Account Number online. In case, you have already generated the UAN before, but have forgotten to note it and want to get it again, you can do so very easily. Here, I am discussing the process to do so. For knowing the UAN status, you either need to possess a Member ID, Aadhaar or PAN. I think you must be having at least one with you. Now, let us start with the process to check the UAN status. First, you have to visit the UAN portal i.e. https://unifiedportal-mem.epfindia.gov.in. Once, you are on the homepage of the unified portal of the EPFO, search for the tab ‘Know your UAN status’ and then click on it. You have to make a selection here. Whether you want to know the UAN status with the help of PF Number, PAN, Member ID or Aadhaar. I am choosing Aadhaar, as I have created the UAN with the help of the Aadhaar and it is handy. If you opt for a Member ID, you have to provide your saved ID here. In case, you get the message that your UAN is already generated, you have to provide some of your personal details for the verification purpose. The detail that portal asks for the verification purpose is simple information about you like your email ID, mobile number, DOB and name. For this, you need not remember the ID details. Together with these details, you have to enter your password as well. The password is needed to automatically register you with the UAN member portal. Now, in the end, you need to fill in the CAPTCHA and search for the ‘GET PIN’ tab and then click. You will now instantly get a PIN at your registered mobile number, which you will need to fill in the column. After entering the PIN, just click on ‘I Agree’ button. Now you may face two situations, if UAN is not allotted somehow, you will be provided with an option to create a new UAN. And if it already allotted, you will get the detail of the same. Isn’t the process of UAN status checking simple? This is the simplest way to check the status of the UAN online. Though there are some other ways also if you do not wish to check it online. But it is the simplest method for sure. Try it once. This link is very useful and handy to check whether your Pension has been credited or not. This link will help you in displaying you’re the amount credited for your Pension along with the history; that is the amount being credited from the beginning. Follow these steps to do it yourself in a jiffy. All you need to have is the information that you need to enter. On the screen Welcome to Pensioners’ Portal will be displayed. There will be two boxes or fields that you will be required to fill in. The first will be Issued Office. Choose the office from where you are getting your EPF Pension. The next field Office Id will automatically get filled in. Next, enter your PPO No. That is all. The screen will show your Pension status. The steps are the same except that here you will have to enter your Date of Birth as well. Here are the steps. There will be four boxes or fields that you will be required to fill in. On the bottom box, fill up the Captcha. You are done. The screen will display the Pension payments done already and credited to your account. You can also view the history and the past credits of your pension. The interest rate that is applied on the EPF fund accumulated is a compound epf interest rate that is decided by the Central Board of Trustees (CBT) and approved by the Government of India. It is payable as on the 1st of April every year. Although the contributions are made monthly, the interest is calculated yearly. At the beginning of every year there is an opening balance which is the amount accumulated so far. Therefore the opening balance for the next year would be the opening balance of this year plus total monthly contributions for the year plus interest on the previous opening balance and total contributions. The interest is only applicable for the EPF balance. EPS balance is not affected as it is a pension scheme. EPFO has more than 6 crores subscribers and this year the interest rates for 2017-18 has been reduced to 8.55% from 8.65% previously in 2016-17. Earlier in 2014-15 and 2015-16 the interest rates used to 8.8%. Our Central Government was recently reduced the Epf interest Rate of 8.55 % and it is the lowest pf interest rate in five years. This is despite the fact that this year the fund gained more than Rs.1000 crores in capital gains by selling off a part of its equity. The CBT’s decision will now be ratified by the Government and then the interest income will get credited into the account of EPFO members. How to Download / Print Updated EPF Passbook anytime at passbook.epfindia.gov.in? Earlier an employee got the information about his EPF Account details only once in a year when he received a printed EPF account statement. That is a thing of the past now as the Employees Provident Fund Organization (EPFO) has already undertaken a digital makeover. Now you can easily download your detailed e-passbook online. There is a more simple process of downloading your passbook with the help of your UAN. The steps for doing this are given here. In case you have an UAN and it is activated, then it is no big deal to download or print your update passbook at any time of the day or night. To download your EPF passbook follow these steps. Keep your UAN and password ready. Your passbook will be displayed on screen. You can now view the EPF Passbook which will be displayed on the right. To save the EPF passbook as PDF; right click the mouse and then select the Save As option. There, you are done. It is such a simple and amazing way to achieve this. What does your UAN Card contain? UAN – The Universal Account Number of the employee is printed in prominent red color on the UAN card. It is printed on both sides of the card. Name of the Employee – The employee’s full name is mentioned on the UAN Card. The name is as provided in the EPF portal by the employer. Father’s Name/Husband’s Name – The employee’s father’s name is mentioned on the card. In case of a married woman, her husband’s name is mentioned. KYC – In this section, if the employee has submitted his KYC documents and got them approved by the employer then Yes is mentioned on the card. In case it is pending, No is mentioned. QR code – On the reverse the card, a QR code is printed. This QR code can be scanned to check the details of the UAN card. This helps in easy authentication of the card. Date Stamp – The date on which the UAN card is downloaded is also printed on the card. These information printed on the UAN card is according to the EPFO database. The database is created by the employer by uploading the documents and details provided by the employee. There can be errors or some data may need to be updated. In such cases you can contact the employer, or the EPFO office. There are several data that can be amended or changed by the employee through the portal after logging in with the required credentials. In case there are errors in your details, you can get them corrected/updated by contacting the concerned EPFO office. EPFO is coming up with several advance features that can be used by its members. It is becoming more and more technological savvy. EPFO has already won the Gold Award for “Innovative Use of Technology in e-Governance” for the year 2015-2016. You can access all the functionalities of EPFO wen portal on the “Umang” App on your smart phone. In the coming days, be ready to get pleasantly surprised more often ! 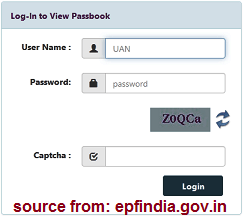 How to Download / Print your UAN Card at unifiedportal-mem.epfindia.gov.in? The UAN card issued by the EPFO, can be considered as one of the important documents that you can have with yourself. It contains the important details relating to the employee. The UAN card is required in case of job changes. The new employer will ask you to submit your UAN card so that your EPF account can be linked with the Establishment account. For this reason, EPFO has brought out the facility to enable employees to download and print The UAN Card from the Member e-Sewa portal. If you have activated your UAN in the EPFO portal, then it is just a simple process to Download or Print your UAN Card. Follow these simple steps to download and print your UAN card. Go to the Member e-Sewa portal: https://unifiedportal-mem.epfindia.gov.in/memberinterface/. Your UAN Card will be displayed on the screen. Now you can Download or Print the UAN Card. One advantage of using the EPF UAN unified portal is that members can quickly check their Provident Fund balance using their UAN and UAN password. You do not have to go to the offices or the bank to check your balance, and you can do it online from your computer. Members can use the online site to make any EPF payments from the EPF UAN unified member portal. Employees under the Employee Provident Fund Organization can get their documents approved, monthly payments, and claim approval from this unified member portal. The employees also have an advantage of transferring their Provident Funds on changing jobs. You are advised to submit form 11 plus the details of both your current and previous employer and all your PF contributions will be auto-transferred to your new account. Members can also download their EPF balance passbook download statement and UAN Card using their Universal Account Number. Due to the high number of person login into the EPFO official website for various services, you may find it time-consuming to check your balance using that site. One can easily use their unified portal to check the balance using the minimum time possible.